In 1947 the body of 22 year old Elizabeth Short was found in two pieces in a parking lot in Los Angeles. 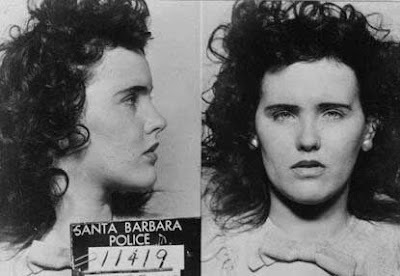 She was not generally known as the “Black Dahlia” during her lifetime. However, after her murder, many rumors and tales have spread about the Black Dahlia, and the investigation (one of the largest in LA history) never found the killers. Ruanel: No, it is not an alien abduction, it is a murder perpetrated by human beings, and there were mutilations and marks that are totally far from extraterrestrial technology. Interlocutor: Would it be worthwhile to talk about this case? Ruanel: It’s an ordinary matter, which had a lot of repercussion back then nothing else. Interlocutor: Just out of curiosity, who were the murderers? Ruanel: They were two people that directly abused of her and they were linked to drug trafficking and all those things. Interlocutor: Were they her friends? Interlocutor: And why didn't the Police find them? Ruanel: Because they had alibis. Interlocutor: Well, I give this matter concluded. This entry was posted at Wednesday, January 06, 2010 and is filed under assassinations . You can follow any responses to this entry through the .